If you’ve been following us on social media, you know that we’ve been living it up in Greece for the past few days. But what you may not know is that on our way to Greece we had a six-hour layover in Philadelphia. Plenty of time to explore the city and of course grab a bite to eat. 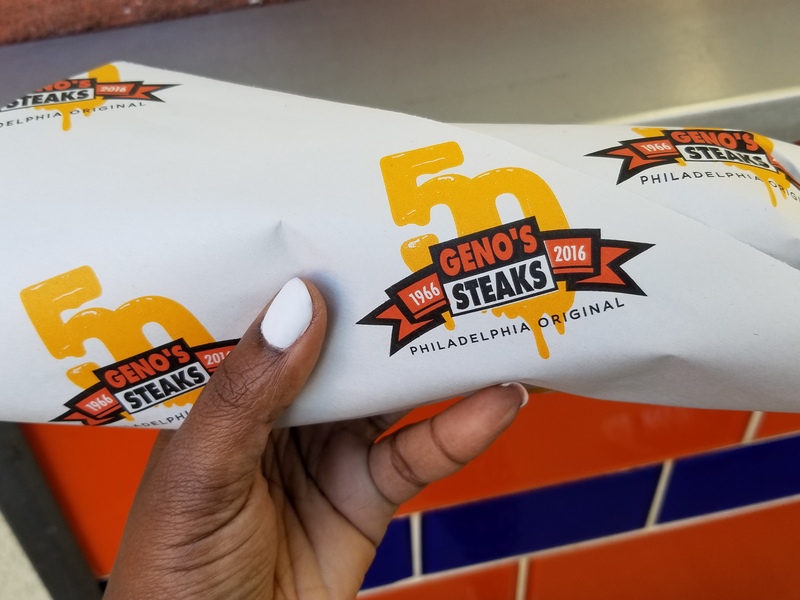 And since we were in Philly, we had cheesesteaks on the brain. This city is of course known for its cheesesteaks, hence the name Philly Cheesesteak. And never the ones to pass up a good food challenge, we decided to end the Great Debate – 2 Girls Who Travel style. We’re talking the battle of who makes the best cheesecake – Pat’s or Geno’s. So we caught an Uber to south Philly and upon arrival and seeing the two famous signs, we just knew we were in for a treat. 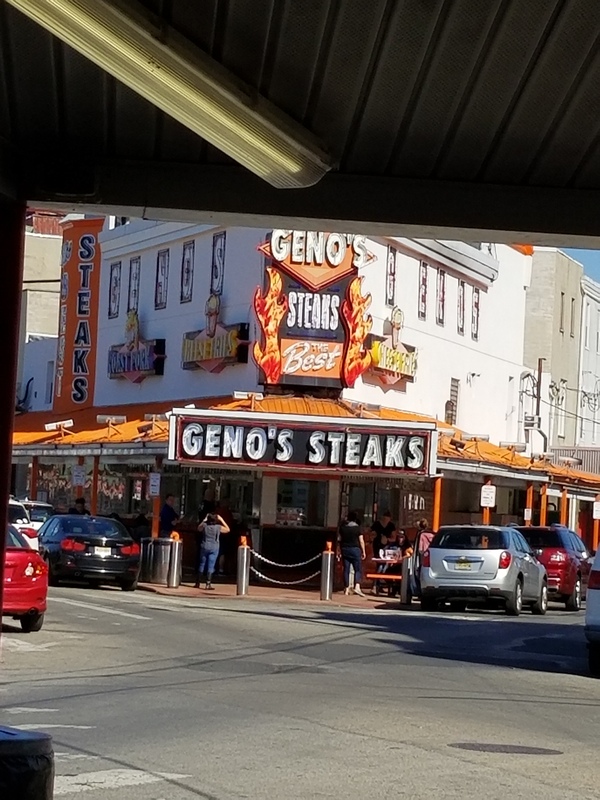 Geno’s: We ate this one first – half each. We opted for provolone on each rather than the popular cheese wiz with onions. (ordered as “provolone wit”). Kim already was at a disadvantage because neither place offered mayonnaise. That’s her thing. 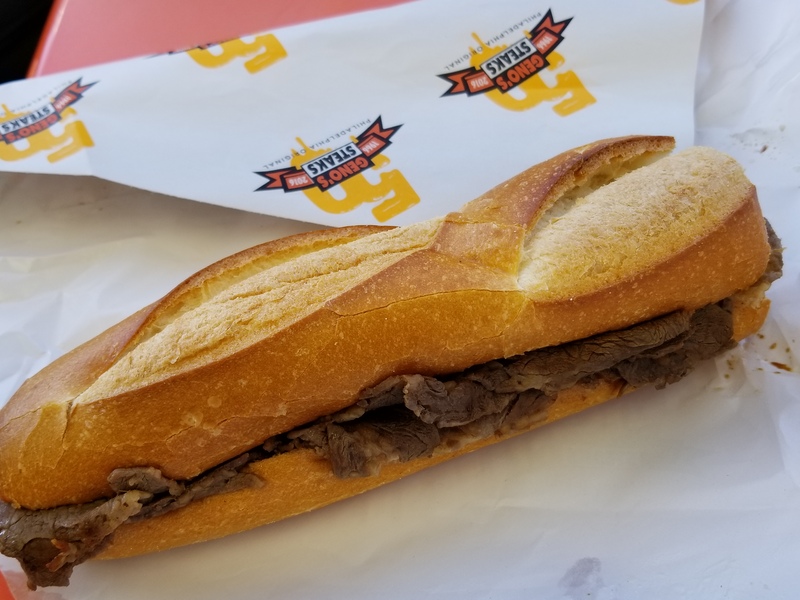 The bread used in Geno’s cheesesteak was a bit too firm for our liking and with the provolone slices hugging the side of the bread, the sandwich felt a bit dry in the middle. 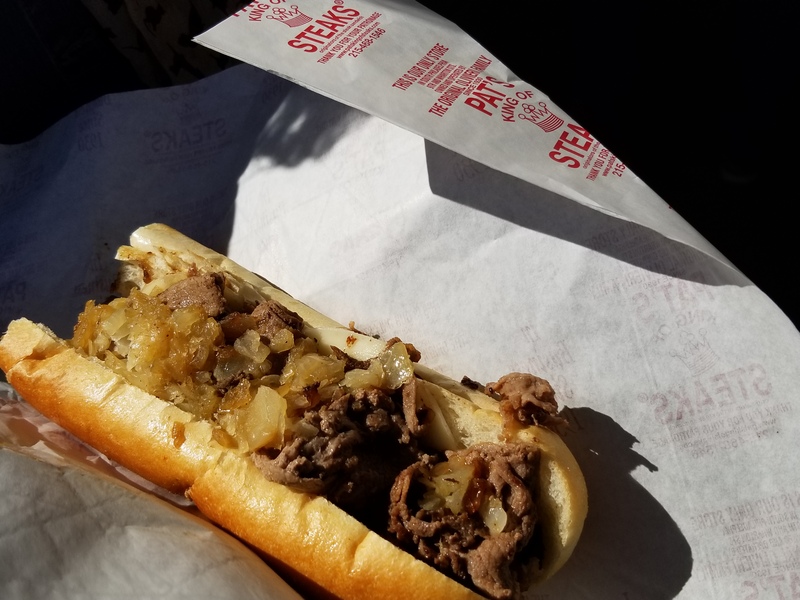 And we’re certain there were no onions on the sandwich even though we specifically asked for “provolone wit” which is supposed to mean a cheesesteak with provolone and onions. The meat itself was shaved/sliced – which we can’t say really won us over either. 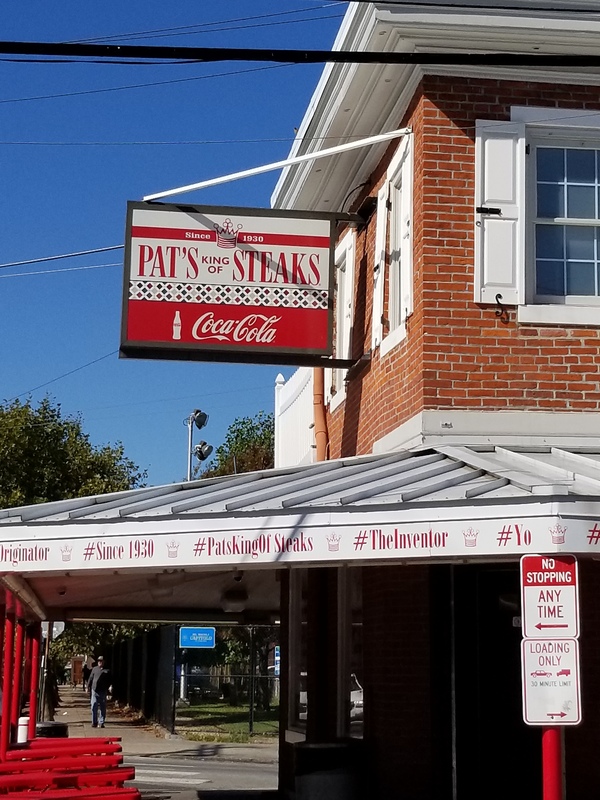 Pat’s: While the bread here was a bit softer and there were visibly onions on top, this cheesesteak didn’t impress us much either. It certainly wasn’t as dry as the one from Geno’s, but both needed salt and pepper. The steak was cut more in skirted strips, rather than sliced, which we liked. Verdict: I mean, if we had to pick one, I guess Pat’s is the sandwich we disliked the least. But in all honesty, if we’re ever in Philly and craving a cheesesteak, we wouldn’t consider either place. 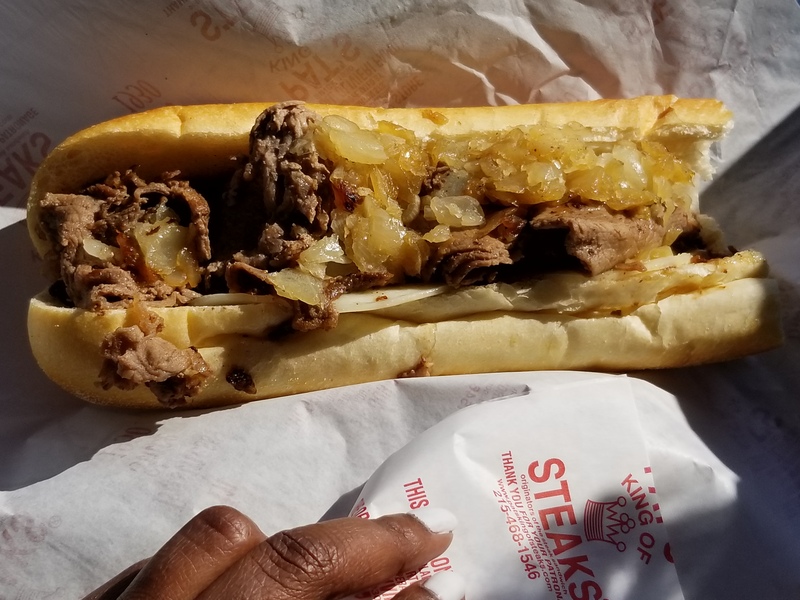 Readers, what’s your favorite place to get a cheesesteak in Philly? How do you order yours? Let us know in the comments!